Your first novel - “The Devil of Light” – is a thriller. What made you decide to write a thriller? I think it decided me! To show just how naively I started the writing process, I didn’t have a genre in mind when I wrote “The Devil of Light”. It was a story that I needed to write, and it ended up being a crime thriller. I love the genre, so I guess it’s no surprise that I’ve ended up writing thrillers. How close is Detective Cass Elliot to you? *Eeek! * I didn’t intend for Cass to be anything like me. Physically, we’re nothing alike. She’s a gorgeous redhead with nice curves. I’ve been told, politely of course, that my figure is somewhat tomboyish! I thought I’d done a great job of making Cass her ‘own’ character, but some of my friends have said that she’s my alter ego. We both grew up with brothers and have no problem living in a man’s world. Cass has Sheriff Hoffner as a thorn in her side, and I’ve had Hoffners of my own. Like Cass, I hate to see a wrong go unpunished, and we’re both a little hard-headed. But that’s probably where the similarities end. Our families are very different and while we’re both highly motivated, it’s in different directions. What kinds of research went into writing The Devil of Light? I wanted to understand the psychology behind cults – in particular, what would make someone who seems happy and successful join a cult. I did some reading on Jim Jones, the Heaven’s Gate cult, and the Koreshians. It’s fascinating, scary stuff. One of my characters sustains injuries at the end of the book, and I wanted to make sure I understood how those injuries would manifest and what type of complications he could experience. Thankfully, we have two RNs in the family who have devious minds – their advice was hugely helpful! I also did a little research relating to weapons. We have a ranch and on occasion have to deal with hogs or coyotes, so I’m used to handling shotguns and rifles. But I spent a little time firing different calibre handguns to understand how they feel and react in the hand. I’m just wrapping up my second book, and will do the same, but focusing more on the rifles and shotguns. You have travelled a lot. How has this influenced your writing? I’m so grateful for the years I was able to travel and live overseas. I love people watching, picking up quirks, body language, and speech patterns. One of the most important things I learned while traveling for business is how difficult it can be to get your message across when you’re in a country where English isn’t the first language. That taught me to think critically about the words I use and to try and deliver my message concisely. Although it’s set in East Texas, “The Devil of Light” includes characters from England and India. I hope my time working with people from both countries lets me portray their mannerisms and speech patterns accurately. Having an English husband definitely helps ensure Bernie Winterbottom, the English character, is fairly represented! 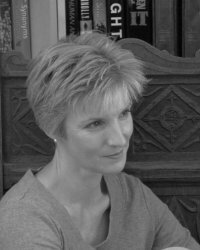 What author(s) would you like most to be compared to? For writing style, Daniel Silva, Stephen King, or John Connolly. I love the way their words flow. They write books I can step into while the outside world disappears. For content, Karin Slaughter or Val McDermid. I think their crime thrillers are gritty and fast-paced. Paul McCartney said: “It’s not unusual for writers to look backward because that’s your pool of resources.” What do you think of this? Perhaps it’s true for songwriters. But I think it’s a narrow view of how novelists work. I believe that our experiences feed into our perceptions of the world and influence how we move forward. It’s how a talented writer takes those resources and applies their imagination to them that leads to compelling stories. How important or how relevant do you think reviews are? Do you think you’ve ever been reviewed unfairly? I think reviews serve two important purposes. They help readers decide whether a book is for them, and they can help a writer hone her craft. I love reading reviews for “The Devil of Light”, with all their praise and criticism. I learn something from every review, and hopefully my next book will be stronger as a result of the feedback. I don’t think I’ve been reviewed unfairly; a review is simply an opinion. Someone likes and has enjoyed what I’ve written, or they don’t. I have seen reviews that seem designed solely to attack an author, but hopefully readers can see through those reviews. In terms of production, I try to write every day. In terms of the creative process, disorganized! I’ll have a general idea for a book, and the details come to me in scenes – not necessarily in the order they’ll appear in the book, which is a tad frustrating. I use Scrivener, which caters to my scattered nature by letting me capture those scenes in as much, or as little, detail as needed. Once I start writing, I can move those scenes around and find their fit within the story, or determine that they’re not relevant and delete them. I’m also one of those weird people who enjoy the editing process. *Yeah, I know, bring on the men in white coats* It slows me down, but I’ll read through my work several times, smoothing word flow, the story line, and character development, while looking for typos. I also use an advisory board of early readers who are delightfully vicious. Their input is invaluable. Tell me about your next book/work-in-progress. It’s titled “The Avengers of Blood” and I’m excited about it! The plot line is a little complicated and I wasn’t sure I could pull it off, but early feedback is positive. Cass is still on suspension after killing a fellow officer, and Sheriff Hoffner refuses to sign her release papers. But when four people are killed in one night, one with the exceptional brutality of a lynching, the Medical Examiner side-steps Hoffner to hire Cass as a temp and loan her to the police department. Evidence shows that three of the murders were committed by the same person, but Cass can find no connection between the victims. Her job becomes more difficult when the shooter targets a fourth person, but he survives and disappears instead of coming to the police for help. When Cass uncovers the true identity of the man who was lynched, the pieces fall together, revealing connections between all five victims, the killer, and a horrific crime committed nearly fifty years earlier. The last question is a freebie! What do you wish I had asked you but didn’t? Now ask and answer that question. No question, Jill, just much gratitude to you for having me. I enjoyed it! 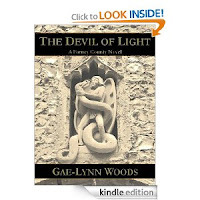 Get The Devil of Light on Amazon. Thank you for having me, Jill! It was such a pleasure to talk with you!